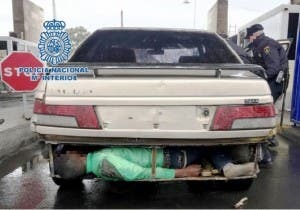 SPANISH border police discovered three migrants hidden in purpose built compartments of a car as it attempted to enter Spain last week. Images released show the migrants from Guinea in West Africa – all in their 20’s – concealed in the bumper and under the dashboard, while a video shows police pulling out two of the semi-conscious men. The vehicle was attempting to cross from Morocco to the Spanish territory of Melilla, but was stopped after a border officer saw a young man dashing out of the car and running back towards Morocco. 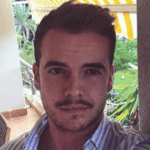 The driver – a 25-year-old Moroccan man – was later apprehended and detained. The migrants, who had shown signs of hypothermia, were taken to the Centre for Temporary Stay of Immigrants (CETI). Police say the Morocco to Spain route is popular among people smugglers who charge large sums for the passage. They added that they cannot search every vehicle due to the effects it would have on queueing. They don’t need to “search every car”, even an untrained dog would have found the poor sod in the bumper. But then of course, the Spanish don’t have much respect for dogs.